I’m not a doctor or mental health professional of any kind, so read this accordingly, but the longer I seek healing for the damage my childhood left on me, the more I realize that I grew up surrounded by narcissistic and borderline personalities. Do you know what happens when you tell a narcissist or someone with BPD that he or she is wrong? That he or she is hurting someone else, especially the source of that person’s narcissistic supply? An explosion happens. The narcissist being confronted with his or her imperfections is Ground Zero. The shrapnel flies outward from the narcissist and hits the other person—the person who is already hurt. This happens because narcissists are so fragile in their self-image that any hint that they aren’t perfect is so very, deeply painful. The same goes for BPD. Somewhere along the line, these people picked up the idea that they’d be abandoned if they don’t produce perfection. The challenge is that, while someone with that feeling could have chosen the (still-destructive, don’t get me wrong) path to perfectionism, the NPD or the BPD person is internally compelled to lash out at anyone who suggests he or she might be wrong, might not be worthy of constant attention, affirmation, and adoration. They’re so afraid of being hurt themselves, that they’ll protect their fragility at any cost. Any cost—as long as it doesn’t feel like it’s coming from their own pockets. In today’s gospel reading, for Monday of Holy Week in Year B, Jesus and the apostles are at Lazarus’s house for a celebratory dinner, old Laz being non-dead and all. Lazarus’s sister Mary shows her gratitude by cracking a jar of super-expensive, scented ointment onto Jesus’ feet and wiping them with her hair. Judas, of course, doesn’t see a thank you gift for Jesus. He only sees what he thinks he’s not getting for himself. Then Judas Iscariot – one of his disciples, the man who was to betray him – said, ‘Why wasn’t this ointment sold for three hundred denarii, and the money given to the poor?’ He said this, not because he cared about the poor, but because he was a thief; he was in charge of the common fund and used to help himself to the contributions. How many things do people demand in the name of “the poor,” when really we just want someone else to make us feel rich? This springs from a lack of gratitude stirred up by a guilty conscience. We seek to discredit people who remind us that we do bad things, so we trash the good things they do. Moreover, we trash the people who are doing good things or receiving good things, because they remind us we could do good things, too, but good for others, we fear, takes away from good for ourselves. We’re not just talking Judas here. Offing Jesus wasn’t enough. The chief priests wanted Lazarus dead, too. Once again, Mary chooses the better portion. Once again, Jesus defends not himself but another. He knows what’s coming. He knows that He’s about to drop the biggest truth bomb of all time on some pretty earthly-powerful narcissists, and He knows which way those explosions go. He knows they’re so afraid of the truth that they’ll cut down any mouth that speaks it. He knows the pain of anyone who’s ever confronted a narcissist. This is the fear that I have, whenever I think of life-giving legislation coming down into our culture, as it stands right now. I don’t fear humans being treated justly; I fear the people who are so afraid of that justice that they’ll protect their own perceived fragility at any cost—any cost at all. It’s the same fear I feel when I think and pray over going to court over crimes committed against me. Honey, I do not want to be that close to Ground Zero, not when I’m the one lobbing the truth bomb. And this year, through this morning’s lectio divina, I discovered that Jesus himself was no stranger to that fear. It was the fear that sweat blood in the Garden of Olives. Of course, it was a fear that Truth could face down, suffer through, and rise above. And this is very likely my biggest cross, my biggest cup to drink. What is yours? Narcissist or victim, you still have a cross. If you’re, like me, afraid of the backlash of any truth bombs that have been placed in your care… I have no answers beyond those Jesus gave us: to take up our crosses—our heavy, heavy crosses—and follow Him. If you’re convincing yourself that the best way to peace is to cut off someone else, you’re not seeking peace. Don’t blow out someone else’s candle and expect more light from yours. If you’re like Judas and the chief priests, you have a cross, too. Your cross is whatever truth bomb you’re avoiding. The Good News? Jesus is offering you the same resurrection that He offers everyone else. You can be made perfect, if you’ll let Him. Today’s guest blogger is Rhonda Ortiz. Let’s hear from her about her journey as a Catholic living with subfertility. Hey there! I’m Rhonda Ortiz. I’m a 34-year-old Catholic convert, wife, and mother of three. Other than chasing after kids, I spend my days writing and working as a freelance graphic designer. I’m also the founding editor of Real Housekeeping, an online magazine with over twenty contributors (and counting!). When Jared and I were first married, we assumed we’d be Good Catholics and beget enough kids to field a football team. I had just graduated college and had no firm career plans—I was just waiting for the blessed arrival of a bundle of joy to keep me busy and happy. That didn’t happen. At first, we assumed it was just a matter of time. After a year, Jared suggested that I see a doctor. That was a last thing I wanted to do. Like the proverbial ostrich, I stuck my head in the sand. If I didn’t learn what was wrong, nothing would be wrong. Right? I spent five frustrated years wondering, if I wasn’t destined to be a mom, what the heck was I going to do with my life. My thoughts ran wild through the rat nest that was my head, making this and that set of plans, seeking…something. Anything! Compounding my quest for daily purpose was the fact that my job at the time—teaching math at a Catholic school—wasn’t the best fit for me. And yet I couldn’t see myself doing anything except teach. I finally agreed to see a doctor and learned that I had endometriosis. I had my first laparoscopic surgery to remove endometrium in June 2007. We assumed I would be pregnant right away, but that also didn’t happen. Fast forward to December 2009. My husband was studying for his doctoral comprehensive exams. I was in the middle of (a yet-undiagnosed) major bipolar mood swing which not only impeded my work but made me unbearable to live with. Yet somewhere in there was time and impetus for intimacy. And then the miracle happened. On Christmas Eve, I discovered I was pregnant. We learned after the fact that four different people, in four different states and with no communication between them, had felt inspired by the Holy Spirit to pray for us at Mass on the Solemnity of the Immaculate Conception. Those of you who are good with NFP can do the math yourselves: this was my peak day. Our first son, Benedict, was born the following September. Our second, Miriam, was conceived a few months after my second surgery and was born in October 2013. And in May we welcomed our third, Joseph, who is our first “Surprise!” baby. Given our previous subfertility, we were shocked, to say the least. They are both difficult to deal with and accept. I suppose one difference I see between the two is that, with subfertility, we have to discern how much medical intervention we’re going to allow in order to conceive again. We know now that I can have children; the question of, “Am I going to have yet another surgery?” is compounded with our prudential discernment about having more kids. NFP has taught me the truth of the phrase, “Knowledge is Power.” Facing my fears and going to the doctor has taught me that it’s better to know, because in knowing I can do something about it. Now I have options. Now I can make decisions. This lesson has impacted all areas of my health. After a major cross-country move I started experiencing more crippling mood swings and anxiety attacks. Thanks to the knowledge of a family member’s recent bipolar diagnosis, I was able to put a word on what I was experiencing and seek professional help. Having proper medical care has made a world of difference to my daily life and especially my marriage. Knowledge really is power. I haven’t experienced the “tough” side of NFP yet, but given that we now know we can have “unplanned” children, I think we’re about to experience it! Before Benedict was born, I felt like I had to explain our childless state to everyone. It wasn’t as if others were prying into our intimate concerns, but living in a vibrant Catholic community as we did at the time, we were surrounded by large families. I was afraid of being seen by others as unfaithful. Those fears were unfounded. No one thought ill of us. In fact, those who knew had sympathy. They prayed for us. They befriended us and welcomed us into their families. We happily conversed about their kids, of course, but they also understood that we didn’t have kids to talk about and therefore talked about other things as well. This is the best thing others can do for subfertile Catholics. We needed friends who could meet us where we were. Thank the Lord, we were blessed to have them. Thank you so much for sharing your story with us, Rhonda. 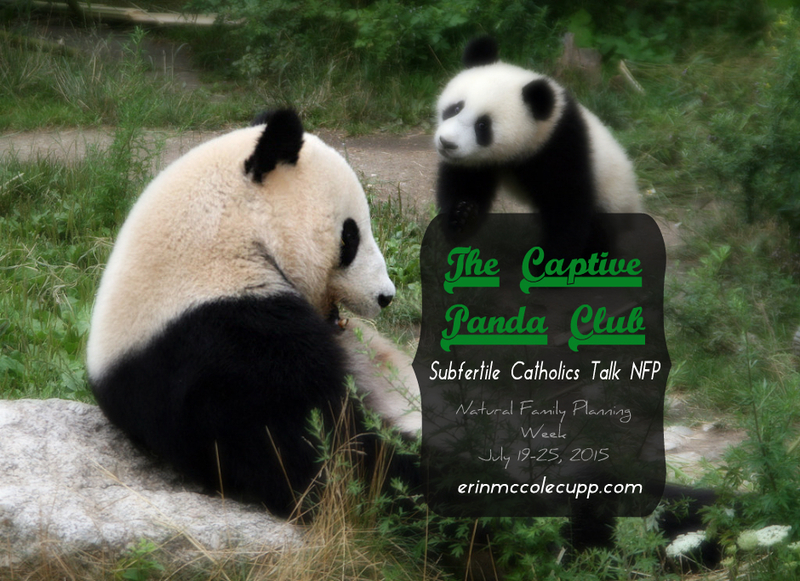 Reader, do you have an experience with subfertility to share with your fellow Captive Pandas? Did you go from infertile to subfertile, experience secondary infertility, or experience a different path all together? What’s the hardest part of being a Captive Panda Club member? What keeps you going in faith? How has God sustained you through it all? What have been some unexpected blessings you’ve found as a result of trusting in Church teaching on fertility? Talk to us in the comments below!